This great new book on the XJ13 gives the first-ever detailed account of the fantastic 5.0 litre four-cam V12 engine which powered XJ13 (and which was intended to power Jaguar road cars too). This brings to light the extraordinary saga of Jaguar’s intended purchasing of Lotus, with the carrot of a Jaguar V12 race engine for Colin Chapman’s Indianapolis aspirations cleverly dangled by Sir William Lyons! A story which has never been told before, it includes a fascinating exchange of correspondence between those two wiley old campaigners, Lyons and Chapman. 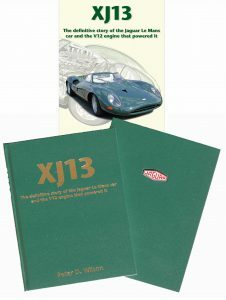 The book also explores other mid-engine designs which Malcolm Sayer proposed, including after the XJ13 project was shelved. It also tells how the eventual production ‘flat head’ V12 engine emerged from the original Baily/Heynes design (codenamed ‘XJ6’) which powered the XJ13, but which proved too bulky and complex for use in road Jaguars. Note: This book will not be available on the internet via Amazon or any of the major retailers. Only by selling direct can this initial low price be achieved. Orders shipped within one to two days.